"Though I am free and belong to no man, I make myself a slave to everyone, to win as many as possible. To the Jews I became like a Jew, to win the Jews. To those under the law I became like one under the law (though I myself am not under the law), so as to win those under the law. To those not having the law, I became like one not having the law (though I am not free from God's law but am under Christ's law), so as to win those not having the law. To the weak I became weak, to win the weak. I have become all things to all men so that by all possible means I might save some." A very practical form of servant leadership is situational leadership. The word "situational" may sound alarming because of its association with "situational ethics." However, situational leadership may be paraphrased as "leadership applied to serving the situational needs of followers." This leadership style starkly contrasts with the typical leadership style that demands followers to comply with the style of leader. It is not a theory but a model introduced first by Ken Blanchard and Paul Hersey in the mid-1970's. Several scholars have since made slight changes to the terminology. It identifies the needs of followers who are developing in competency and confidence/commitment. 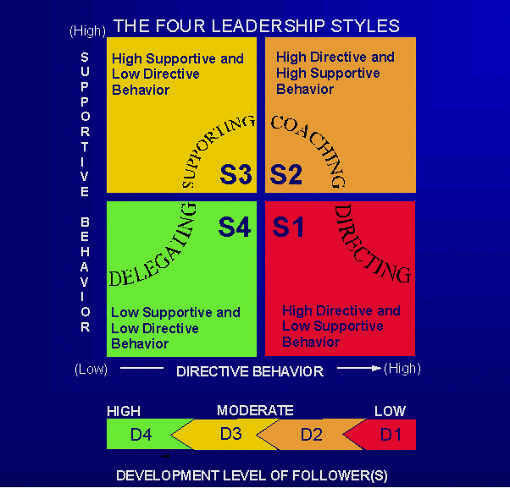 Depending on where they are, leaders should apply different leadership styles so that leaders help followers develop. Typically, scholars use a quadrant describing four different types of followers. Directing/Telling - This leadership style is applicable to followers who may be new to the job. They may display a high level of commitment and enthusiasm but lack the level of competency required. This person needs a lot of instructional telling or directions. Selling/Coaching - This leadership style is applicable to followers who have learned something but are not competent enough to handle jobs themselves thus requiring coaching or selling. They tend to show dwindling enthusiasm or commitment to the job after the initial stage of high enthusiasm. Supporting/Participating - This leadership style is applicable to followers who are now competent enough to handle the job without supervision, but the level of commitment or of confidence may be lacking, thus making it difficult for leaders to delegate fully. These types of followers need encouragement through support and their participation in the decision-making process to gain experience and confidence. Delegating - This leadership style is applicable to followers who are competent and confident in handling the job. They tend to have a high level of commitment to the job. They deserve an opportunity to handle the job with delegated empowerment: responsibility, authority and accountability. Please note that the situational leadership is specific to a task or a situation, not a person. One may be very good at a certain task, but not at others. Imagine what consequences may follow if a leader were to apply a leadership style inappropriately. For example, if one delegates a responsibility to someone who does not have competency and/or confidence, the outcome would most likely be disastrous. Likewise, if one wants to give specific instructions to someone who is competent and confident, it is likely that you lose that person. Situational leadership is not only meaningful within the Christian context. It is also adopted at many secular organizations, such as Walmart. Apostle Paul appeared to have applied this situational leadership principle to his evangelism efforts as described in the scripture above. Missional Business entrepreneurs should learn to adopt and apply situational leadership since they are to serve the needs of followers. Usually at the end, businesses also benefit from higher productivity in addition to helping the followers develop their potential to the fullest level of God's creation and intent. SfK Korea - The process of establishing SfK Korea is picking up steam. Once established, SfK Korea will manage a BAM Fund as a private equity/loan fund to support missional businesses. We pray that the Lord will enable us to complete the process by the end of this year. SfK Rwanda - SfK Rwanda is on hold until the first missional business that SfK Rwanda plans to support takes shape and is established. The business is about to begin construction for a medical clinic and a guest house. SfK Thailand - The way of establishing SfK Thailand has become more evident legally and financially. SfK Life Corporation is staying on course to make its first investment in Thailand within 2016. Investment Policy - At last, the draft is being prepared and personnel has been assigned to complete the preparation of SfK Life's first investment within 2016. The development of a cloud-based database using Salesforce.com continues. It has been delayed somewhat from the initial schedule due to manpower constraint; however, we are striving to make progress. Neo Moravian BAM School in Seoul, Korea in July/August - This 4-week intensive training will equip missional business entrepreneurs to be deployed to several nations. Jeffrey will serve as a member of the panel to evaluate the final business plans submitted by the participants and encourage them for the final two days on August 18 and 19. SfK Life Corporation (USA) board meeting in August - The board will hold a regular board meeting on August 12th. Korean BAM Global Gathering in Sorak, Korea in September 5-9th - This event has been renamed from BAM Consultation. Jeffrey will serve as a speaker and an adviser for this 5-day event. If you are interested in participating in this event, please send an e-mail to Jeffrey at jlee80111@gmail.com. BAM Conference in Los Angeles in September - This useful and informative 3-day conference (September 16-18) will help those interested in learning more about BAM. They will hear from and meet with those who are currently involved with BAM ministries. For more information please visit www.bamconference.com. The Lord may be gracious to us in developing the cloud-based database. SfK Life Board members will continue to seek God's wisdom in carrying out their responsibilities. The Lord may guide us in establishing SfK Korea and a BAM fund. The Lord may show us the way in identifying more missional businesses that produce transformational Kingdom impact. May the Lord bless you and your families so that His Kingdom may expand and advance through you and your families. Shalom in Christ until we send you the next newsletter.